Behold the beautiful cover of The Bone Witch's sequel. 😍 I can't believe the cover has finally been shared. I'm completely in love with this series by Rin Chupeco, whose writing is beautiful. The world building is simply amazing! Everything is perfection! If you haven't read The Bone Witch yet, I recommend you to do it NOW (ignore the Goodreads ratings, I promise you that you won't regret it). 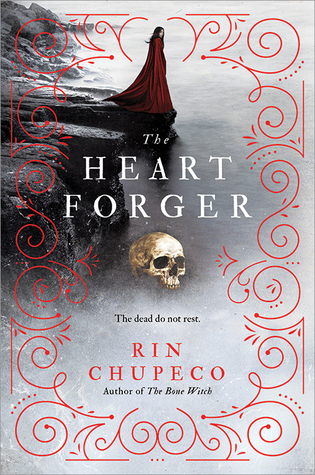 The Heart Forger is expected to be released on March 20th 2018. In The Bone Witch, Tea mastered resurrection―now she's after revenge... No one knows death like Tea. A bone witch who can resurrect the dead, she has the power to take life...and return it. And she is done with her self-imposed exile. Her heart is set on vengeance, and she now possesses all she needs to command the mighty daeva. I haven't read any of the books in this series but wow, that is such a gorgeous cover!